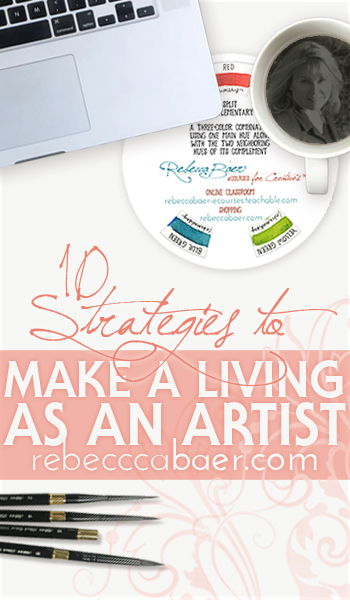 When relying on your art to make a living you often need to look to more than one income stream. There are many ways to generate income. Not all will be suitable for everyone; a good fit depends on your skillset and artistic style. Of course you have a website, right? How will anyone know your art exists if it is all neatly tucked away in your studio? An independent internet presence is a must. Make sure your page is accessible to all--not just those with a social media account. You can create a page on blogspot (and other sites) for free and no one needs to log in or set up an account to reach your page. You can expand to include product information and eventually an online store if that is the route you choose. You are at the mercy of the social media platform you use. A simple change in an algorithm and suddenly your content no longer reaches your friends or followers unless you ante up for ads. Use social media to reach out and invite readers to join your mailing list so that you always have a way to get in touch with them. Which brings us to the next essential component, a mailing list. Your website and social media accounts should have a way to subscribe to your newsletter. The importance of owning your mailing list cannot be overstated. When you have built your own list of subscribers no one can withhold them or limit your access. Do you have a mailing list (or wish you did)? I've had an email subscriber list for many years. It allows me to stay in touch with fellow creatives, share news, events and new product/educational resources. After many years of using a distribution channel through my website host I decided to make the switch to an outside service provider that offers more features as well as automations. After looking at a variety of options I went with Mailer Lite. The reasons are many. Their pricing is better than many of the competitors, emails are free and you can set up a series of emails to automatically welcome new subscribers. You can also add individual subscribers or bulk-import existing subscribers so you don't lose your old list. You have the ability to segment your list into groups. If you send a campaign and they are in multiple groups they only receive it once, rather than receiving duplicate mailings. There are many other features that exceed the scope of this post so if you’d like to know more you can check out MailerLite directly. I have found their online help to be very responsive. Once you have established a web presence and begun to build your mailing list consider the following and see which revenue streams may fit your work. This can be one of the most difficult areas to realize a profit when you consider the hours invested in a piece. On the other hand, if you publish materials based on the works, you can generate income in multiple ways from the same art. If you can express your creative steps or techniques using the written word and photos or video then you can present these in various formats to reach those interested in acquiring similar skills. I offer tutorials, magazine articles, a blog and a newsletter. In my newsletter I share the latest releases, eCourses, etc., but I try to include something to show appreciation for my subscribers as well. This may be a discount/special, tips or technique and theory articles. My blog has a broader focus and covers anything that I find interesting or helpful. Some use ads to generate income from their blog—I do not. Some teach locally, others at conferences or private events. You can share your entire process from conception to completion or you can share any portion of the journey. Stand-alone techniques and theory are also popular. I offer online courses. For both the student and the instructor, there are many benefits to online education. If this interests you then take a look at “What you need to know about online classes”. When you are teaching or demonstrating always use a marketable surface. You may need to refine, frame or finish the piece after class but this can then be sold to supplement your income. There are probably specific tools or products that facilitate your success. Offer these for sale. This provides easy access for your students or readers while supplementing your income so it is mutually beneficial. A variety of venues exist so you may need to try several to find the right fit. Some shows focus on finished work while other are primarily supply oriented. Those in which I have participated have been centered around art education with related product sales from manufacturers and designers. I could never bear to create repetitiously so shows selling duplicate works are not my cup of tea. As I have turned my focus to art licensing and online education I no longer attend conventions as a vendor or educator but do continue to manufacture and sell products via the shopping segment of my website. When publishing, if you have a favorite brand of paint or brushes, etc. check to see if the manufacturer offers payment for endorsing their products. I don't suggest you choose products based on whether or not the manufacturer pays for publication as credibility is important (to me). Select your supplies based on quality and go from there. Affiliate links also abound but don’t expect to make your next mortgage payment from the revenue. Those who will promote anything for the promise of payment (or free product) can cause readers to view affiliate links with suspicion. I occasionally include an affiliate link for a product or service if it is something that I use and like but these are few and far between. My approach is, if I like it and am going to provide a link, it may as well be an affiliate link as long as it is convenient. I would rather have credibility than a commission. I want my customers/clients and readers to know that they can trust my recommendations. Not all art is suitable for licensing so you will have to explore this avenue to see if it's appropriate for your work. There is a plethora of information online. Joan Beiriger’s blog and Porterfield’s Fine Art are good places to start.